Leading figures in engineering and politics recently joined up with students, apprentices and graduates for the launch of a new engineering mobile phone application. 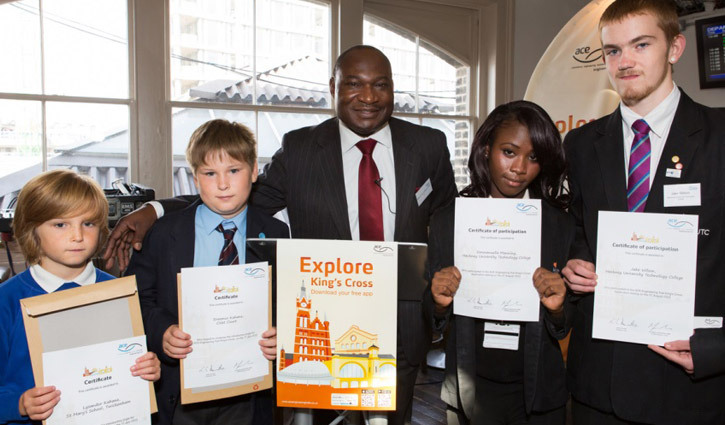 The ACE Trails app draws attention to the remarkable engineering behind locations such as King’s Cross with the aim of drawing young people towards the trade. London’s Deputy Mayor for Business and Enterprise, the Chairman of Crossrail, and Network Rail’s Chief Executive led the launch event. They were joined by pupils from Hackney University Technical College - who helped test software – and recent graduates embarking on engineering careers. Taylor Woodrow’s Ella Secker, a former sponsored student who worked on the King’s cross redevelopment, was also a featured speaker. The new app, which provides an augmented reality walking tour of King’s Cross, plays fifteen videos made by engineers describing the engineering work that has gone into transforming and regenerating the area.